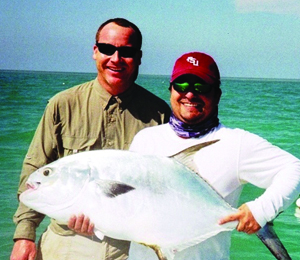 The adventure with Bill Stockton, aboard the Dream Sickle, begins on the magic carpet ride through the crystal clear waters deep into the backcountry flats where you will experience extreme shallow water sight fly fishing for Tarpon, bonefish & the elusive permit. Captain Bill has been pursuing the Big three throughout his life and specializes in first time spin and fly fishermen. Imagine fulfilling wading opportunities to fish the hottest bonefish & permit flats in the world. You can encounter first light in the Marquesas, the Content Keys, or a sunset tarpon expedition. Experience big game on light tackle aboard the "dream sickle". Captain Bill is U.S. Coast Guard licensed and fully insured. Dream Sickle charters will provide all tackle, licenses and bait. A cooler is also provided for your beverages and lunch. There is a two angler maximum. Be sure to bring a hat, sunscreen, polarized glasses and protective clothing to enjoy this tropical paradise. I have been to the Bahamas many times, but Dream Sickle is one of my favorite trips! It includes everything that everyone should do here. As a Bahamas veteran, I can say only the best about this experience!